Q. How can I determine if my pumping system is a good candidate for improved energy efficiency? The first step in system optimization is performing an assessment and documenting the indicators in the list. Since a pumping system will operate at the intersection of the pump curve and system curve, the next step is to evaluate the pumping system to determine the baseline system requirements or system curve. This is what the system requires to meet its purpose, not what the current state of the system is. Next, system operating data should be acquired with permanently installed process transmitters or portable instruments, which measure system flow rates, system pressures and power consumption. The data collection should be done in a manner that allows pump flow and head to be evaluated against the system’s performance curve, and it should be collected over an appropriate amount of time to represent the normal operating condition. For example, systems with varying or seasonal loads may require long-term data logging equipment. After sufficient data is collected, it should be compared to the measured rates of flow/head and the required rates of flow/head. This may reveal an imbalance between measured and required conditions. To learn more about assessing pumping systems and a new certification program for Pump System Assessment Professionals (PSAP), refer to the PSAP Body of Knowledge Guidebook and the PSAP Certification Study Guide at www.pumps.org/psap. Q. What are some common positive displacement pumps uses in the wastewater industry? A. Positive displacement pumps provide a certain volume of liquid with every revolution of the shaft that is relatively independent of the differential pressure, which makes them different from rotodynamic or centrifugal pumps. Water/wastewater treatment is the second largest positive displacement pump market. There are many kinds of positive displacement pumps used in the wastewater industry, but images for four types are provided. Peristaltic pumps are the most common type of flexible member positive displacement pumps. There is no need to worry about corrosion or contamination of parts with these pumps because the fluid is contained within the tubing. In addition, the simple design makes them low cost and easy to service. These pumps can also pump high viscosity fluids with a high percentage of solids well. 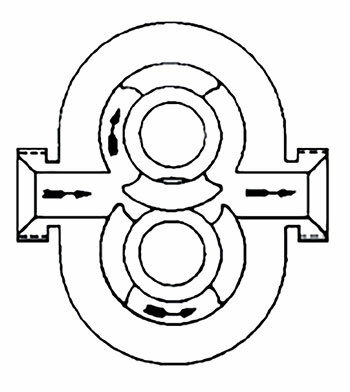 Lobe pumps use lobes on the rotating elements within the pump casing to direct the pumped fluid. Since the lobes do not contact each other, lobe pumps can move large solids and slurry-laden media. Two-lobed pumps tend to handle larger solids and high-viscosity fluids better than three-lobed pumps at the expense of increased pulsation. Also, rotor surfaces in the pump cooperate to provide continuous sealing. Circumferential piston pumps are well suited for a wide range of applications due to their relatively low speeds, low inlet pressure requirements and large cavities. 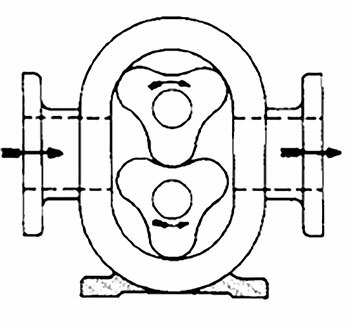 In this kind of pump, each rotor has one or more wing lobe elements, called pistons. 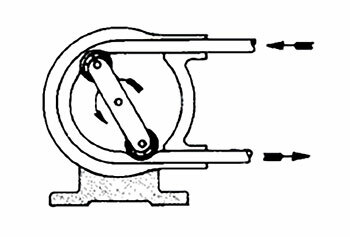 The fluid is carried from inlet to outlet in spaces between piston surfaces. These pumps can handle high viscosity fluids and have low shear at low speeds. Progressing cavity pumps’ unique design makes them versatile and useful for handling difficult to pump fluids, such as highly viscous or abrasive fluids. Progressing cavity pumps are commonly used to pump raw sewage and sludges. In addition, progressing cavity pumps can pump shear sensitive fluids and fluids with large particles. Not pictured but also commonly used for disinfectant are controlled-volume metering pumps. These deliver flow streams at adjustable, yet controlled, rates with a high degree of accuracy. These pumps are most commonly used for the injection of chemical additives, proportional blending of multiple components, or metered transfer of liquid additives. For more information regarding pumps used in the wastewater industry, refer to the “Positive Displacement Pump Certificate” training modules by at www.pumps.org.